Ich wollte unbedingt ins Hamnet. Komfortabel per WLAN mit all meinen Geräten. Also habe ich meinen Router mit OpenWRT so eingerichtet, dass er sich mit dem VPN verbindet. Denn eine HF-Verbindung habe ich leider nicht. Allerdings gibt es dabei noch ein paar Sachen zu beachten. Nachdem das VPN eingerichtet wurde, muss erst einmal die Firewall Zone geändert werden. Stelle sie z.b. auf „HamnetVPN“. 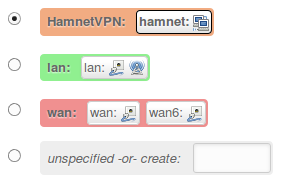 Dazu gibst du bei unspecified -or- create: einfach „HamnetVPN“ ein. Danach muss in der Config-Datei /etc/config/network die Zeile option auth 'pap' hinzugefügt werden, denn die Verbindung wird unverschlüsselt aufgebaut. OpenWRT versucht standarmäßig das verschlüsselte CHAP zu nutzen. Am einfachsten kann die Datei mit nano editiert werden. Falls noch nicht installiert, wird das mit opkg update gefolgt von opkg install nano getan. Wir speicern mit Strg+O und schließen mit Strg+X. Das Hamnet-VPN ist erfolgreich verbunden. Die statische Route unter OpenWRT eingerichtet für das 44.0.0.0/8 Netz. Diese statische Route bewirkt, dass die Pakete fürs Hamnet auch dahin kommen, und nicht ins Internet geschickt werden. Dies machen wir unter Network -> Static Routes. Denke aber daran, dass du deine VPN vor unbefugter Nutzung schützen musst. Dein WLAN sollte verschlüsselt sein. I really wanted to use Hamnet. Comfortable via Wi-Fi with all my devices. So I have set up my router with OpenWRT so that it connects to the VPN automatically. I can’t use RF because I don’t see the repeater. However, there’s still a few things to note. 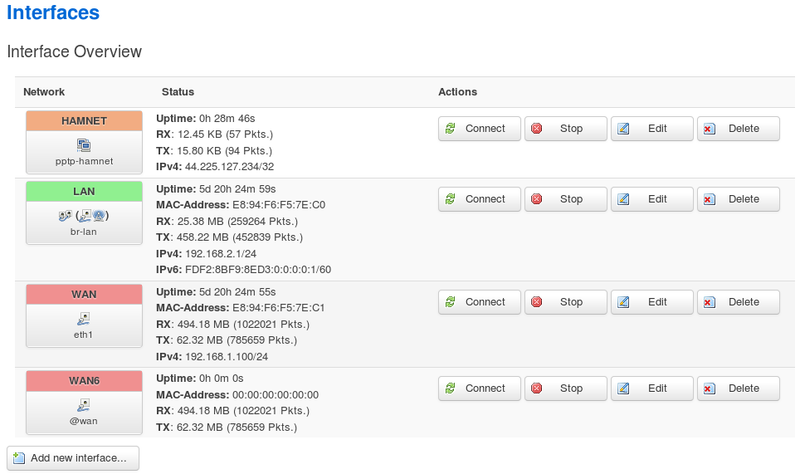 After the VPN was set up once the firewall zone needs to be changed. For example, set it to „HamnetVPN“. Just type in field unspecified -or- create: the name of the firewall zone, for example „HamnetVPN“. Then you have to change the Config-file /etc/config/network and add line option auth 'pap', because we neeed an unencrypted connection. OpenWRT tries to use encrypted CHAP as default. The easiest way to edit this file is to use nano. If not installed yet that can be done with opkg update and opkg install nano. The code firewall zone „HamnetVPN“. We save with Ctrl + O and end with Ctrl + X . The line beginning with mppe must be commented out as above with the # . Then we save and restart the router. Now would you see at menu point "interfaces" that the VPN has a 44. * IP address. The code Hamnet VPN is connected successfully. The code static route set up under OpenWRT for the 44.0.0.0/8 network. This static route causes packets for Hamnet also to get to, and not be sent to the Internet. We do this under Network – & gt; Static Routes. But remember that you need to protect your VPN from unauthorized use. Your WLAN should be encrypted. name is David, call is CT1DRB and my qth is 15 km south of Lisbon. I followed your instructions and my GL.INET is working more or less. In fact I have access to HAMNET, if I am connected to the router under an SSH session from computer to router. If I try to connect to HAMNET from my computer I do not get it. Most probably I did something bad so I am here to get help from you. Best 73 and have a nice weekend. it seems that your HAMNET-Connection is not routed to the Clients. Make sure you have set up the static route for 44.0.0.0/8 over the hamnet connection. in fact I filled board with the 44.0.0.0/8 in the HAMNET interface, still no luck. I performed a wireless connection from my home wireless router to the GL.INET router, then I have a LAN connection to my computer, IP is 192.168.1.5. It is from here that I have problems. Maybe it is NAT misconfiguration but I do not know how to solve it. tks for your picture. I have disabled the WAN interface. However, it still does not work. Compared to you I have another interface, it is the WWAN one. In a particular email I send you more details about it. Why did you disable the WAN interface? You will need it. EDIT: Just for the record: Make sure you have „option metric ‚0‘ “ under config route! Pse can you help me with the openvpn configuration on the small router gl.inet , configured with openwrt latest version to connect hamnet on it. The gl.inet router is active with your setup ! use your call and password .. and then follow your setup. Many thanks for your information on your webpage. Have you also set up the router in a way, that allows to connect to hamnet and internet over the same wifi? note, so no-one will have done the same fail.